A perfect glamping holiday for your family. 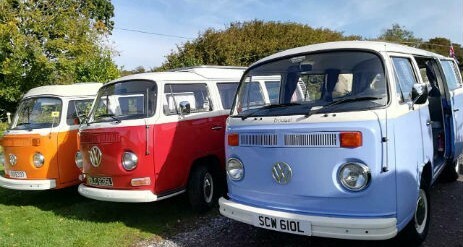 Come and hire one of our modern T5 or Classic 1970’s VW Campervans on the Isle of Wight and enjoy the freedom and flexibility that makes the VW Camper a classic experience for all ages. 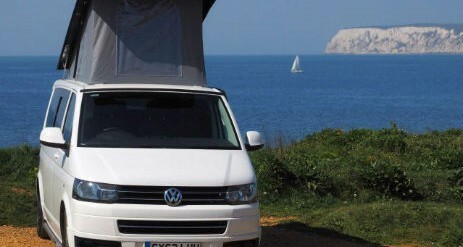 Offering miles of beautiful beaches, footpaths & cycle paths, whether you decide to have a relaxed or active holiday, the Isle of Wight has it all and our Campervans will help you make the most of it. Water sports, walking, cycling or sailing, the Island has so much to offer. Enjoy a memorable family campervan holiday, a quiet break for two or a holiday with friends – there is something for everyone. The Isle of Wight is one of the most idyllic yet exciting parts of Britain. A place that seems to exert an irresistible attraction that brings visitors back time after time, perfect for exploring in a campervan, the rugged coastline & sandy beaches provide many picturesque locations to park & put your feet up. With the Island accessible by car ferry, catamaran & hovercraft your holiday can be an adventure from the start. Regular trains from London Waterloo can bring you to the Island in less than 2 hours and as Southampton Airport is easily accessible from the Red Jet terminal, your transfer to the Isle of Wight will be, not only enjoyable but stress free! Our happy colourful campervans are overflowing with character and charm. They even have a kitchen sink! Plus they are equipped with all the utensils you will need to whip up a meal should you want to. Bedding, towels, tents and insurance are also included at no extra cost. Compton is a 1975 Devon van. 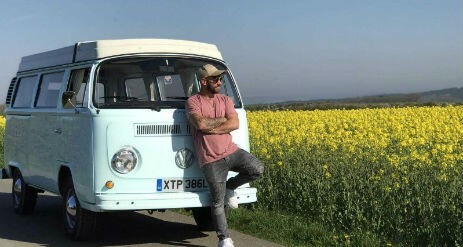 His Westfalia style ‘pop top’ roof provides a great double bed platform plus the rock n roll bed means that he can comfortably sleep and travel 4. Compton has featured in various magazines & had a new engine in 2014 so continues to run beautifully. Dougal is the latest addition to our classic campervan fleet. Born in Australia in 1973, he was imported to the UK 13 years ago. In 2015 we found him in Devon and after a five month refit we gave him a new lease of life on the Isle of Wight. Having hired him as a tin-top camper for 3 years, in 2019 he will have a roof conversion to make him a far more versatile campervan. With the option of a child bunk in the front cab and with his 2019 roof conversion he will be able to accommodate families of 5. 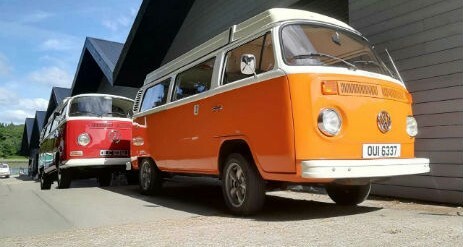 Oliver is our 1972 type two Volkswagen Campervan in cream over Chianti red. He has a re-furbished interior with gas hob, sink and fridge. Oliver has 2 bunks in the pop top roof suitable for younger children & with his classic rock n roll bed he can accommodate a family of 4. 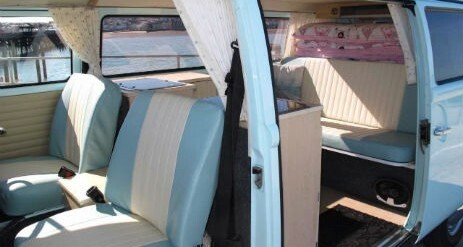 Zebby is our beautiful 1973 Camper in duck-egg blue. She has a full width rock n’ roll bed and since March 2015 she has her brand new Westfalia style roof and a lovey new interior. With the use of one of our tents she can accommodate and transport families of 5. She really is a lovely VW Camper. Born in 2010, Dylan is our newly converted (2018) automatic T5. Dylan joined our fleet of VW campervans in March 2018 and he is very excited about all the adventures that he is going to enjoy each year. Offering a modern automatic drive experience with power steering, cruise control, air-con and rear parking sensors, this long wheel base VW Transporter is available for hire on and off the Isle of Wight. Born in 2013, Isla is our manual LWB T5 campervan. With the option to roam away from the Isle of Wight onto the mainland, Isla joined our fleet in April 2017 having been converted into a campervan. 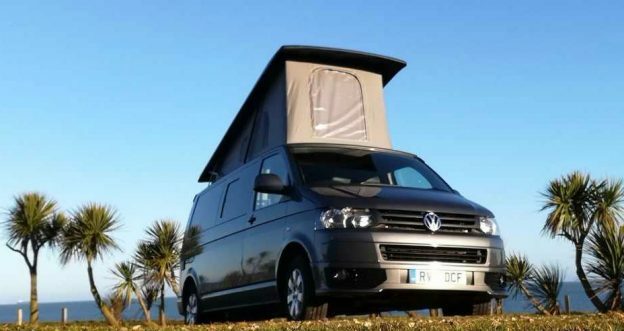 Offering the modern drive experience with power steering, cruise control, air-con and rear parking sensors, this long wheel base VW Transporter is available for hire on and off the Isle of Wight. WHAT’S INCLUDED IN YOUR HOLIDAY COST? – No Hidden Extras! Bike Rack for Isla the T5 – Can carry 3 bikes.